In my last Constitution 101 post, I established that the Bill of Rights was not originally intended to apply to the states. 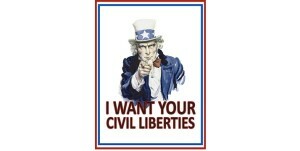 Note: The “I Want You Civil Liberties” print is by Matt Greganti. You can order it HERE. But what good would the first 9 amendments do if the states could ignore them? People wouldn’t have any civil rights to protect them from the state they currently reside in, except the ones that the state chooses to protect. With the incorporation, it adds another layer of protection to those rights so that the federal government can enforce them if the state fails to. There are some rights that people should have regardless of what state they reside in, and the Bill of Rights is a pretty good list of them. If the federal government fails to protect certain rights, then what? In the scenario you described people only have the rights the feds chose to protect. Perhaps we need another layer – a world government – to protect rights. After all, there are some rights people have regardless of what country they reside in. The issue you are missing here is even if you’re right, even if we need the feds to police the states and protect rights, this was NOT the intent of the Bill of Rights. It was only intended to limit the powers of the federal government. The 14th Amendment was NOT intended to “incorporate” the BOR and apply it to the states. So the American system with incorporation is unconstitutional. If that doesn’t matter, if the intent and meaning of the Constitution don’t matter because you’ve decided that this other system is better, then why does any part of the Constitution matter? What power do the first nine amendments have if we are simply ignoring what the Constitution means? None. Americans have stripped all of the power from the Constitution because they ignore what it means and apply it how they see fit. If you want to be ruled by unaccountable politically connected lawyers and you think they are going to “protect your rights,” I say good luck with that. The second crucial point is that expanding government power and centralizing authority is a far greater threat to your liberty than a state violating your rights. Again – what do you do when the Feds violate your rights? You take action such as voting bad politicians out, you protest, you propose constitutional amendments, you work through the federal courts. You don’t run to the UN and demand that some international body force the U.S. government to do what you want. I’m saying just take it down a level. If a state government violates your rights, take those types of actions at the state level. Change your state constitution. Or you can leave the awful state. Don’t run to the feds and empower them to rule over you.